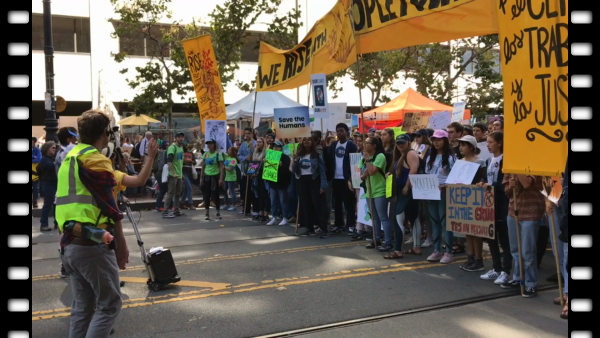 On Saturday September 8, 2018 tens of thousands of people gathered in San Francisco California and marched through the streets demanding "bold action on climate, jobs and justice." Photos and video from the climate march. In 2015 former President Barrack Obama declared that climate change was a threat to global security. He stated climate change was "contributing to increased natural disasters, refugee flows, and conflicts over basic resources like food and water". However one year after Trump took office he removed climate change from his National Security Strategy and continues to reverse many Obama era ideas and rules regarding the climate. But before Trump's decision city and state officials met in Chicago at the North American Climate Summit and decided to implement a plan called the Global Covenant of Mayors for Climate and Energy. Recently Governor Jerry Brown of California has signed executive order SB100 that will commit "the state to clean electricity by 2045." It is obvious California is dealing with some weird effects of the climate change for instance increased wildfires, less annual rainfall, and drought. Locally rain fall has been minimal. I learned a lot at that march. For instance I did not know Native American women are subjected to hate and violence. A comment from a Facebook friend "Some of the most powerful, yet abused women in our nation. Lowest pay, per dollar a white man makes, most likely to be raped and beaten, and worst access to medical care..." After all the years and sacrifices Native Americans made because of the white man they still do not get treated with respect and dignity? I am a huge consumer of oil. I don't know how to not be. I love internal combustion engines, and my car. I don't own a gas hog, but I do own a vehicle that gets me to places my feet cannot.